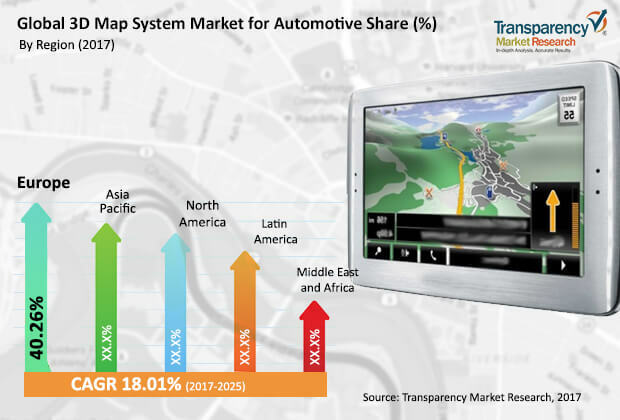 The global 3D map system market for automotive is highly fragmented due to the presence of large number of players, according to Transparency Market Research (TMR). The players in the market are getting into strategic alliance and collaborations with other players in the market that will help them to gain stronger hold in the market. HERE is known as the global leader, which excels in generating 3D and HD maps. The company has also launched a cloud platform as a service (PaaS) that will help in increasing the logistic capabilities for shipping companies. Some of the other key players in the global 3D map system market for automotive are TomTom International BV, Robert Bosch GmbH, Aptiv, NVIDIA Corporation, DENSO CORPORATION, Elktrobit, Dynamic Map Platform Co., Ltd., Civil Maps, Axestrack, Nippon Seiki Co., Ltd, BAE Systems Plc., Continental AG, and Harman international. Among these global companies, Continental AG and Robert Bosch GmbH are leading the global market by providing advanced technologies in areas of software and hardware. As per the recent report published by TMR, the global 3D map system market for automotive is expected to attain a valuation of US$ 4 bn during the forecast period starting from 2017 to 2025. The market is projected to expand at a CAGR of 18% during the forecast period. Based on vehicle type, passenger vehicle segment is expected to lead the market as compared to commercial vehicles. Increasing demand for passenger cars have led this segment to lead the market. On the basis of geography, Europe is leading the 3D map system market by holding high percentage of market share in 2016. North America is expected grow in 3D map system market by expanding at 19% of CAGR during the forecast tenure. The 3D map system market is projected to flourish in coming years because of increasing adoption of newer technologies and the capacity of vehicles. These developments are a part of product differentiation by original equipment manufacturer (OEM). Autonomous cars have gained popularity and are being tested for on road performance by various companies. These autonomous cars are equipped with live HD maps giving constant information about the current traffic conditions, road closure, and weather conditions. Increasing demand for drivers assistance systems that is capable to facilitate the drivers by guiding them through acceleration and decelerating of the vehicles with a better understanding of the surroundings. Therefore, the 3D map system market is projected to rise in sync with the development of drivers assistance system. Conversely, the 3D map system market is also experiencing certain restraints that may hamper the growth of the market in coming years. High cost related with continuous development in 3D maps systems is one of the significant factors hindering the market growth. Moreover, high additional cost attributed to constant updates to get accurate data could restrain the market to grow at an increasing rate. However, increasing preference towards internet of things and availability of fully automated vehicles will grow the 3D map system market during the forecast period.